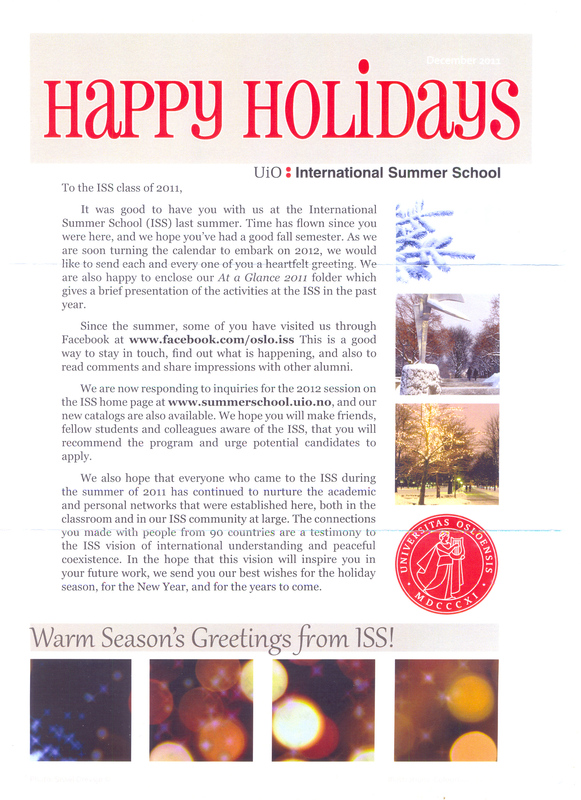 Yesterday, I received the holiday greeting card from ISS. Well, it is not really a card but it does resemble the usual Christmas card. 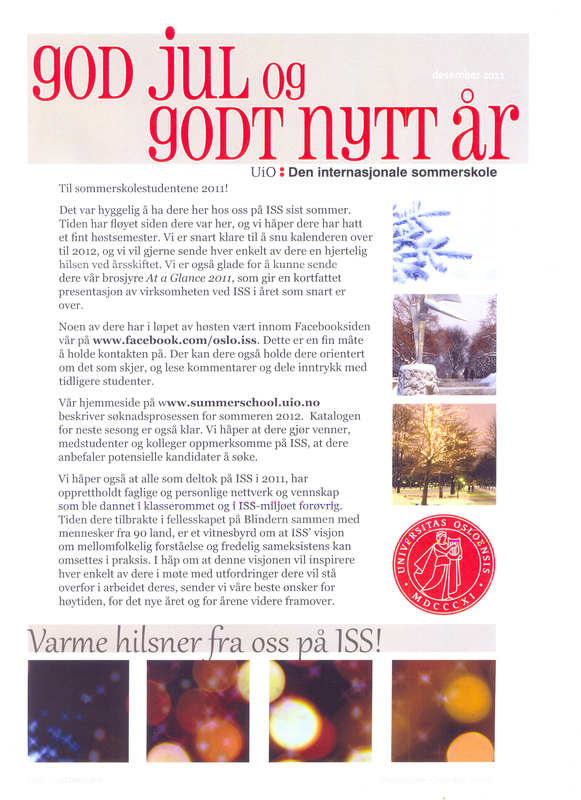 It was mailed last 16 December; arrived here in the city on 6 January and in the university on 9 January. For some reason, it was not immediately given to me. Anyways, it was such a delight to get the “Happy Holidays” greeting from ISS. Then it hit me, has it been five months since? Wow. Time is swift. In an instant, I was brought back to that beautiful summer and the happy feeling it gives. Yes, I had an unforgettable summer last year! Then somewhere in the middle it tells of some relevant information about the next summer school session. And the last line hit me too. It says,”In the hope that this vision (international understanding and peaceful coexistence) will inspire you in your future work, we send you our best wishes for the holiday season, for the New Year, and for the years to come”. Just very very nice. It is so heart-warming and again brings back that spirit of gratefulness. I am forever grateful to have spent six beautiful summer weeks in Oslo. I feel honored and privileged to have been there. I do my best in living out the lessons and the experiences that ISS gave me. More importantly, I keep the friendships I have formed with the amazing people I met there. Thank you, ISS! Keep up the very good work and best wishes for 2012.
in the greater scheme of things, i am just a mole. but i am an awesome, fabulous and gorgeous mole! my life is anchored on faith, hope and love. This entry was posted in Celebrations, People, Travel. Bookmark the permalink.